Mold remediation should only be performed by certified mold remediation professionals. Mastertech of Eastern PA is fully trained and certified to provide the safest and most effective mold remediation services in Eastern PA. We have been voted “The Best of the Best” by Angie’s List 2 years in a row! We are A+ rated by the Better Business Bureau and are fully licensed and insured. Each Mastertech of Eastern PA mold remediation is backed by a 5-year, mold-free warranty. We are committed to doing the job right the very first time to ensure you and your family’s safety. We use oxidative mold remediation that harnesses oxidizing agents, surfactants and surface cleaners that target bio-contaminates found in our homes, schools and commercial buildings. The oxidative remediation process has been proven to be more effective at removing bio-contaminants than any other remediation method in use today. Not only is the process more effective, it is also environmentally safe. The process does not require the use of powerful pesticides and there are no dangerous residual chemicals or heavy metals remaining after remediation. Because the process is safer and more effective, Mastertech’s professional mold remediators are able to increase project safety and efficacy. Mold is most often the result of a water leak, excessive moisture that has been overlooked or untreated or poor ventilation. If these conditions exist, Mastertech technicians may need to address them in order to prevent recurrence. Mold spores that are carried in the air pose a risk of respiratory allergies and distress. They may also spread the mold colony to previously unaffected areas. Containing the contamination is critical to safely complete the mold remediation. Mastertech has the equipment and training to assure proper containment during the clean-up process. Mold can be safely cleaned from most surfaces without the use of toxic agents or bleach. In some cases, contaminated materials may require safe removal and disposal. Mastertech’s mold remediation technicians are trained in the most advanced techniques for the safe, effective removal and disposal of mold-infested materials. Mastertech utilizes modern oxidative technology for mold remediation. This technology has transformed an industry that was once relying on hazardous abatement methods that were developed during the 1980’s. Biological organisms require a unique decontamination protocol designed specifically to remove and prevent its regrowth. 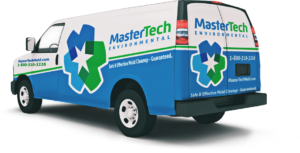 Mastertech Environmental is certified to perform mold removal throughout Eastern Pennsylvania. If you need mold removal in Philadelphia, PA, mold removal in Bucks County PA, mold removal in Chester County PA, mold removal in Delaware County PA or mold removal in Montgomery County, PA then we are the team with a safe, effective and affordable solution. Recurrent water leaks, burst pipes, HVAC leaks, a wet basement or a damp crawlspace? Water stains on walls, floors or ceilings? Discolorations on basement walls or other building materials? Mold symptoms that are only present in one property and not others?